Before my recent trip to Cuba, I had a bunch of questions. What were the people like, how do we get from one region to another, how can I convert my US dollars to Cuban tourist currency, etc. However, the biggest question I had was how could I get connected and access my email? Like many of you, I live on the web and need (well think I need) to be constantly connected with my tech clients throughout the world. How would I manage this? My early research indicated the internet access was non-existent or at least awful. I was facing a week of not being in contact – it was a scary feeling. The good news is that the web access is not as bad as indicated but a lot of it depends on where you are and how you connect. Unlike most parts of the world, there are not free WiFi hotspots in nearly every coffee shop and fast food restaurant. Even though the telecommunications organization ETESCA (Empresa de Telecomunicaciones de Cuba S.A) is run by the government, there are no municipal WiFi networks open to the public and tourists. Instead, using the internet and getting access to your accounts is a multi-step process. First, you need to get a temporary user name and password. These are officially sold at ETESCA offices and then unofficially re-sold by various business, hotels and streetwise entrepreneurs at a mark-up. 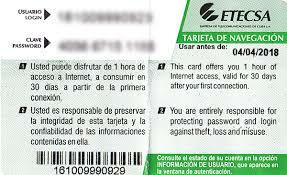 This mark-up can be worth it as there is often a long line at ETESCA offices to buy the cards with the user name and password. The official cost of an hour of internet access is $1.50 per hour (last year it was $2 per hour). You can buy access by hour increments or you can buy a 5 hour pass. Interestingly, there is a cheaper plan (10 cents an hour) for accessing the web but it is only for Cubans who want to access Cuban web sites and destinations. By the way, all of these plans are evolving and by the time you read this, prices may have dropped again. As I was saying, there is a multi-step process to get on the web. Step one is to buy a card - either from a ETECSA, Telepunto office or a reseller. You can buy up to 3 cards at once – either the one hour variety or the five hour variety. Interestingly, you will need to have your passport available to make the purchase. The next step is to find a Wi-Fi hot spot. Once you have found the Wi-Fi hot spot, you then find a good, strong local network and log on. The next step is to open up your browser on your phone or laptop – I successfully used Chrome. On my Galaxy S5 android phone, it usually took a while for the server to talk to my phone and open up the sign-in page. Be patient. Then depending on which type of card you have, you carefully scratch off the wax to revel the password that goes along with a temporary one-time user name. Or, if you are using the tear-open card, CAREFULLY open it up to reveal the temp user name and password. After entering the user name and password, and hitting “acceptar” or “actualizer” you should be connected. At this point, be careful. Open up a new browser window and start your session. CAPTION: The Nauta log on window lets you get online, tells you how much time you have left on your car, and allows you to log off, saving your remaining time on the card. If you close the ETECSA or “Nauta” window, you will find it hard to close out your account successfully. If you don’t close it right, the web connection will remain open until your entire time is used up. This happened to me once or twice. It is a big problem. One option, if you can’t find the Nauta sign up window, is to punch in this url (http://1.1.1.1) into your browser. It might let you log off. Or not. At one casa where I stayed, the only way to end the internet session was to go over to the Wi-Fi router and physically hit the reset button. Unfortunately, his log off issue is common when using a WiFi signal that is weak or has too many users already on it. And remember, if you don’t log off correctly, the network can continue to run and can consume all of your remaining paid for minutes of internet access. 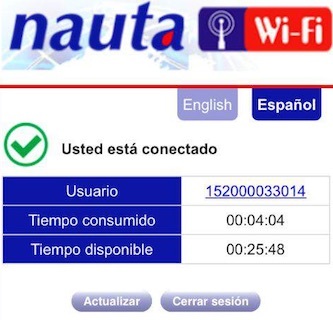 The standard online Nauta window will tell you how much time you have used and how much time you have left. To end the session, punch “Cerrar sesion” or “Ayuda”. Another option is to visit a bigger hotel with WiFi and try to log on using your cards. Sometimes they will want you pay an additional fee. Some of the ETECSA offices offer WiFi, some do not. In Vinales, you will see a crowd gathered outside, around the ETECSA office, to get online. In Varadero, there is no WiFi at the ETECSA building, but they have about seven desktop machines inside where you can use your ETECSA cards. It is hit and miss. Sometimes you get a good connection and sometimes not. I found that once I was online, it took a long time to actually access my email server. However, once accessed, the actual data flow was fine. I could read, review, delete, write and send emails. However, attachments were pretty iffy as the actual connection speed was low. The max speed should be about 125 KB/s. According to the people I spoke to, there is no government firewall. You can access any website anywhere in the world from Cuba. I did not do a thorough test but I was able to get on Google news and find out what was happening in the rest of the world. In addition, I was told that there is no censorship – that the Cuban government does not read or censor web communications. Once again, this is what I was told. How to find the WiFi hot spots. In Havana, the big city, there are hundreds of WiFi hot spots with more popping up every day. However, there are no signs announcing their presence. Instead, just find a corner, a park or a location where a bunch of people are holding up the phones and are on the web. Daytime, nighttime – finding a group of people with phones is the best way to find a hot spot. 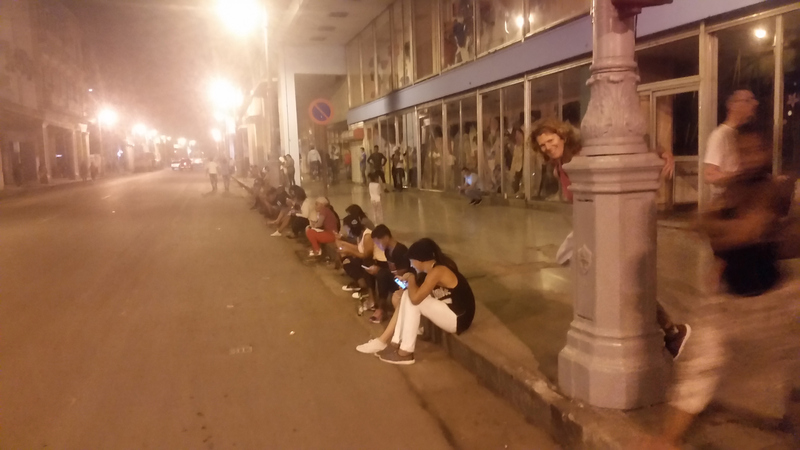 CAPTION: If you need a WiFi hot spot in Havana, just look for a bunch of people on their smartphones. In the other cities – especially rural locations – there might not be any access at all or it might be spotty. Before you head off to Cuba, do a web search and find sites that offer up t0 date lists of possible hot spots. So, if you need to stay connected while in Cuba, do your web research first, while you still have a good web connection, and make list of suggested WiFi locations, especially if you are not staying in Havana. By being patient, buying and using the ETECSA cards, you will be able to stay connected - more or less. Yes, it is slow, yes it is expensive, but it does work. Here is a good Cuban website that explains it all - https://norfipc.com/cuba/como-conectarse-red-wi-fi-etecsa-cuba.php, If you don’t speak Spanish, just hit the Google translate button.